Are there Gods, or aren't there? It is often asked if there are gods in Buddhism. The short answer is no, but also yes, depending on what you mean by "gods." It also is often asked if it is all right for a Buddhist to believe in God, meaning the creator God as celebrated in Christianity, Judaism, Islam and other philosophies of monotheism. Again, this depends on what you mean by "God." As most monotheists define God, the answer is probably "no." But there are lots of ways to understand the principle of God. 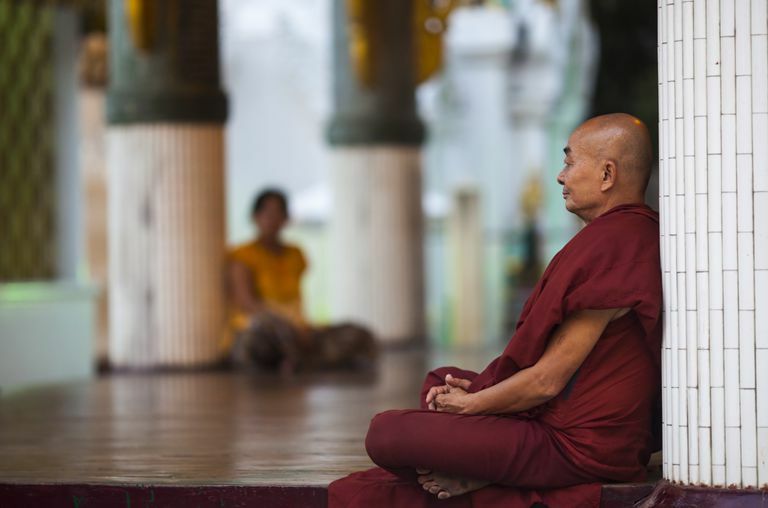 Buddhism is sometimes called an "atheistic" religion, although some of us prefer "non-theistic"--meaning that believing in a God or gods really isn't the point. But it's certainly the case that there are all kinds of god-like creatures and beings called devas populating the early scriptures of Buddhism. Vajrayana Buddhism still makes use of tantric deities in its esoteric practices. And there are Buddhists who believe devotion to Amitabha Buddha will bring them to rebirth in the Pure Land. What Do We Mean by Gods? Let's start with polytheistic-type gods. In the world's religions, these have been understood in many ways, Most commonly, they are supernatural beings with some kind of agency---they control the weather, for example, or they might help you win victories. The classic Roman and Greek gods and goddesses are examples. Practice in a religion based on polytheism mostly consists of practices to cause these gods to intercede on one's behalf. If you deleted them the various gods, there wouldn't be a religion at all. In traditional Buddhist folk religion, on the other hand, the devas are usually depicted as characters living in a number of other realms, separate from the human realm. They have their own problems and have no roles to play in the human realm. There is no point praying to them even if you believe in them because they're not going to do anything for you. Whatever sort of existence they may or may not have really doesn't matter to Buddhist practice. Many of the stories told about the devas have allegorical points, but you can be a devoted Buddhist for your whole life and never give them any thought. Now, let's move on to the tantric deities. In Buddhism, tantra is the use of rituals, symbolism and yoga practices to evoke experiences that enable the realization of enlightenment. The most common practice of Buddhist tantra is to experience oneself as a deity. In this case, then, the deities are more like archetypal symbols than supernatural creatures. Here's an important point: Buddhist Vajrayana is based on Mahayana Buddhist teaching. And in Mahayana Buddhism, no phenomena have objective or independent existence. Not gods, not you, not your favorite tree, not your toaster (see "Sunyata, or Emptiness"). Things exist in a kind of relative way, taking identity from their function and position relative to other phenomena. But nothing is really separate or independent from everything else. With this in mind, one can see that the tantric deities can be understood in many different ways. Certainly, there are people who understand them as something like the classic Greek gods--supernatural beings with a separate existence who might help you if you ask. But this is a somewhat unsophisticated understanding that modern Buddhist scholars and teachers have altered in favor of a symbolic, archetypal definition. Although they may not practice formal tantra, there are tantric elements running through much of Mahayana Buddhism. Iconic beings such as Avalokiteshvara are evoked to bring compassion to the world, yes, but we are her eyes and hands and feet. The same is true of Amitabha. Some may understand Amitabha as a deity who will take them to paradise (although not forever). Others may understand the Pure Land to be a state of mind and Amitabha as a projection of one's own devotional practice. But believing in one thing or another really isn't the point. Finally, we get to the Big G. What did the Buddha say about him? Well, nothing that I know of. It's possible the Buddha was never exposed to monotheism as we know it. The concept of God as the one and only supreme being, and not just one god among many, was just coming into acceptance among Jewish scholars about the time the Buddha was born. This God concept may not have ever reached him. However, that doesn't necessarily mean that the God of monotheism, as commonly understood, can be dropped seamlessly into Buddhism. Frankly, in Buddhism, God has nothing to do. The creation of phenomena is taken care of by a kind of natural law called Dependent Origination. The consequences of our actions are accounted for by karma, which in Buddhism is also a kind of natural law that doesn't require a supernatural cosmic judge. And if there is a God, he is us, too. His existence would be as dependent and conditioned as ours. Sometimes Buddhist teachers use the word "God," but their meaning is not something that most monotheists would recognize. They may be referring to the dharmakaya, for example, which the late Chogyam Trungpa described as "the basis of the original unbornness." The word "God" in this context has more in common with the Taoist idea of "the Tao" than with the familiar Judaic/Christian idea of God. So, you see, the question as to whether there are or are not gods in Buddhism can't really be answered with a yes or no. Again, though, merely believing in Buddhist deities is pointless. How do you understand them? That's what matters.